When one first meets Bill Dorsey you feel as though you have met the quintessential artist. As he shares his background and talents with you, one realizes the true depth of his genius. Some of this genius may be inherited from his impressive lineage of inventors and pioneers. Bill’s father, Herbert Dorsey Jr., was a Harvard-educated meteorologist who participated in the Byrd expedition to the Antarctic in the late 1930s being among the first exploration party to winter at the North Pole. In addition, his father became the first American to drive a dog sled team over the Greenland ice cap in the 1940s. His grandfather (on his mother’s side) diplomat Joseph Ballantine, was an associate of Cordell Hull, the secretary of state in the Roosevelt administration. His grandfather (on his father’s side) physicist and inventor Herbert Dorsey created the fathometer, an instrument for measuring ocean depths and helped to develop long distance telephone service. His great-uncle George Dorsey, was a world renowned anthropologist. Bill is very proud of his family history and keeps extensive archives, including some of the equipment his father used half a century ago during an historic North Pole expedition. Dorsey developed a love for Alaska when his father was stationed there with the Air Force from 1949 to 1951. Following his graduation from high school, he returned to this land of adventure, piloting a Piper Cub from California to Alaska in 1961 in the then-rapid time of five days. Considering he only had 50 hours of flight experience, it was considered an astonishing feat at the time. Snow capped Alaskan mountains are reoccurring themes in the artist work. The artists’ studio sits on a property that has been owned by the Dorsey family for more than four decades. The beautiful hills of Ojai serve as a constant inspiration to the painter. 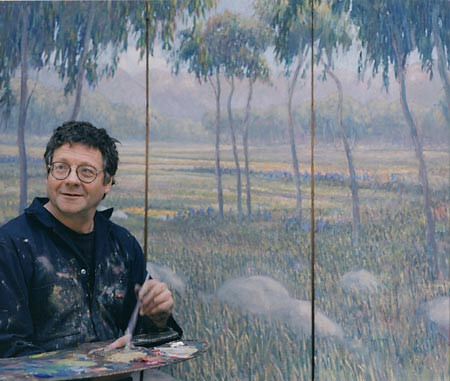 Dorsey prefers to work under natural light and has constructed elaborate skylights to provide the optimum daylight painting conditions within his studio. William B. Dorsey’s documentation took place in 1998 and was sponsored by Hal Berger. The FOTM Archive contains extensive information about this artist.